The 1950's was a challenging time for Hamilton, not unlike companies in today's economy. 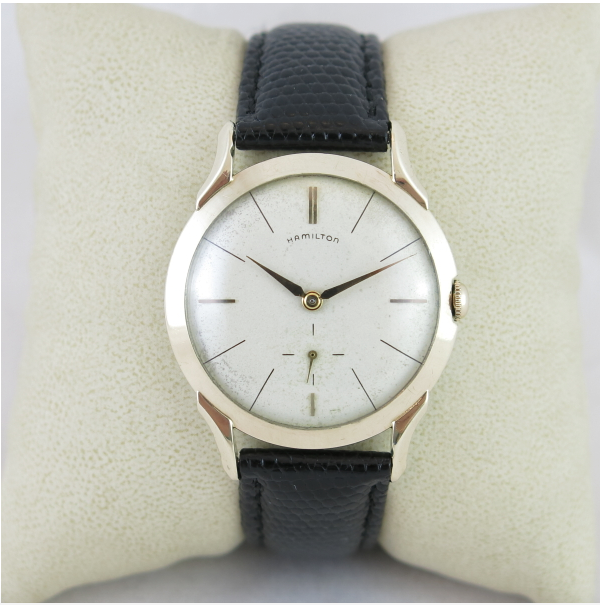 Competition from foreign countries was tough and Swiss watch manufacturers specifically offered quality movements at a low price point. Hamilton endeavored to compete nonetheless and introduced a variety of models with Swiss-made movements in rolled gold plate cases as their entry-level lineup. However, Hamilton also continued to produce it's own best-in-class movements at a slightly higher price point with gold filled cases. A good example is the 1955 Powell. It was produced for four years, through 1958. 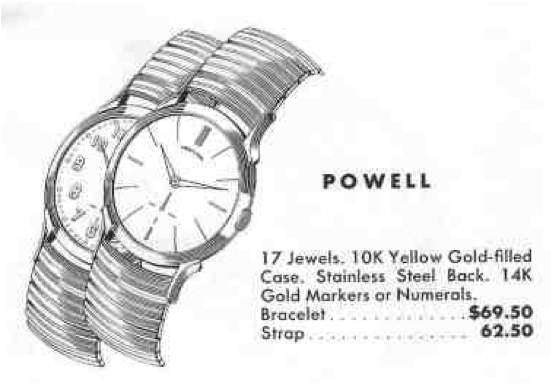 The Powell came in a 10K yellow gold filled case with a pop-on stainless steel back. The sterling silver dial is white finished with 14K solid markers or applied gold numerals. I think the marker dial is the more common of the two. I've seen black dialed versions but I don't know if they are authentic, as the catalogs don't mention that as an option. 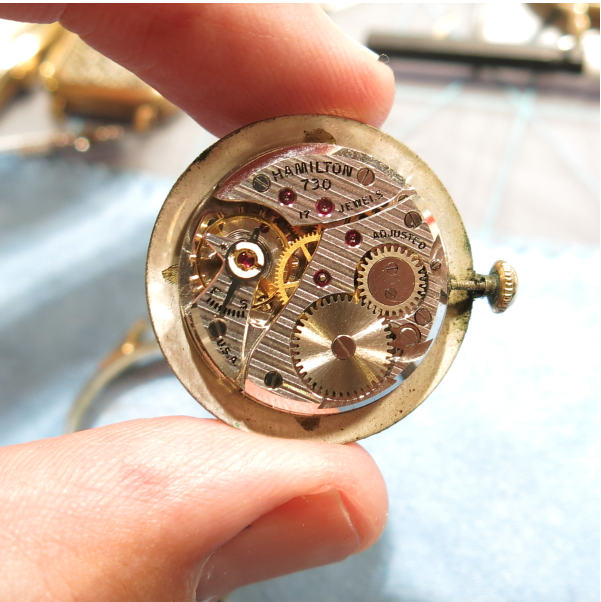 Under the hood you'll find Hamilton's 8/0 sized 17 jewel 730 movement. This is an upgraded version of the 747 movement with shock jewels on the balance assembly. It's a great movement, in my opinion, very simple, easy to work on and performs great. The Powell is a surprisingly thin watch but that could also be because it's a nice size. It measures about 32 mm wide and 42mm long. I recently picked up a Powell project watch. It came on a Speidel expansion bracelet, a good sign that it wasn't original as Hamilton rarely used Speidel for bracelets. The crystal was cracked and there was a surprising amount of verdigris inside the case - that's corrosion you'll see on gold filled cases where dissimilar metals meet. 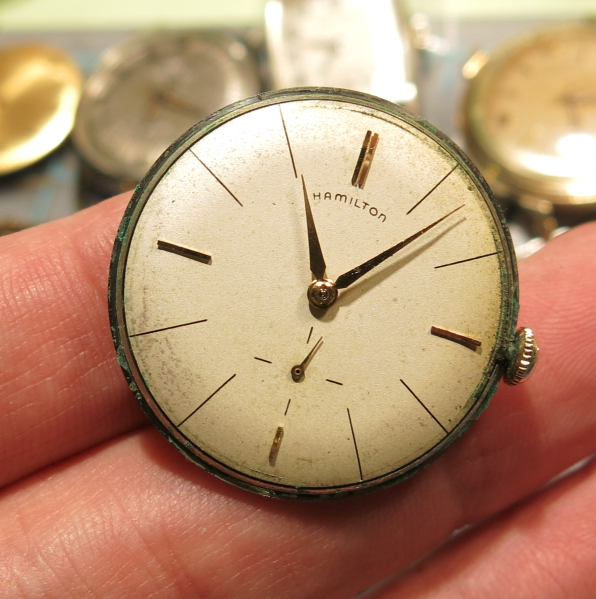 The white dial has a faint patina forming and you can see in the shot below the verdigris on the outside. Cleaning white dials is very tricky business. It seems like they will only get so clean before the printing comes off next. So you need to know to stop when they're still a little dirty or be ready to get the dial refinished. Here's a nice shot of 730 movement. 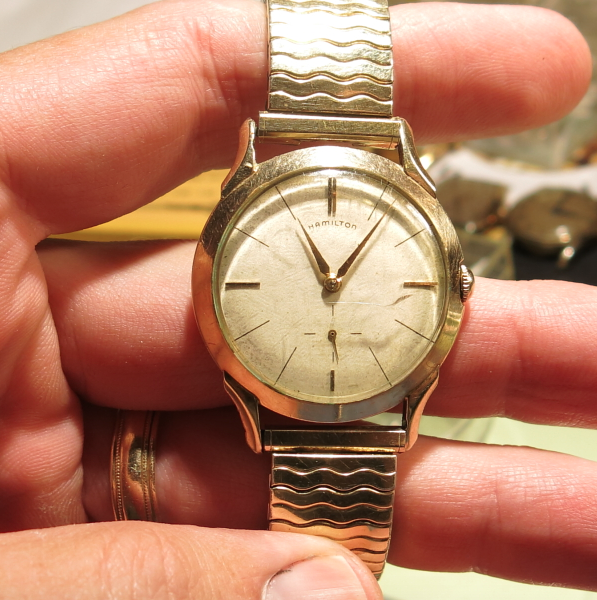 I think if you've ever had a hankering to take apart a watch and see if you could put it back together again, then your best option is a 747 or 730 movement. They really are a breeze and I don't think I've ever broken one (although there have been some hairspring issues in my past). Some of the screws are pretty small though and it's quite likely you'll lose one if you're not careful. It takes a very gentle touch with the tweezers to not send a screw flying off, never to be seen again. And here's the finished product, all polished up with a fresh genuine lizard strap and a new glass crystal. The dial got a little better but still has some faint coloration on the outside - but that just helps the watch look authentic, I think. Turns out a fellow collector and friend of mine just got a Powell too - but of the AGN variety so here's a photo of his to complete this post. I like the AGN dial - it's a sharp, clean looking design. 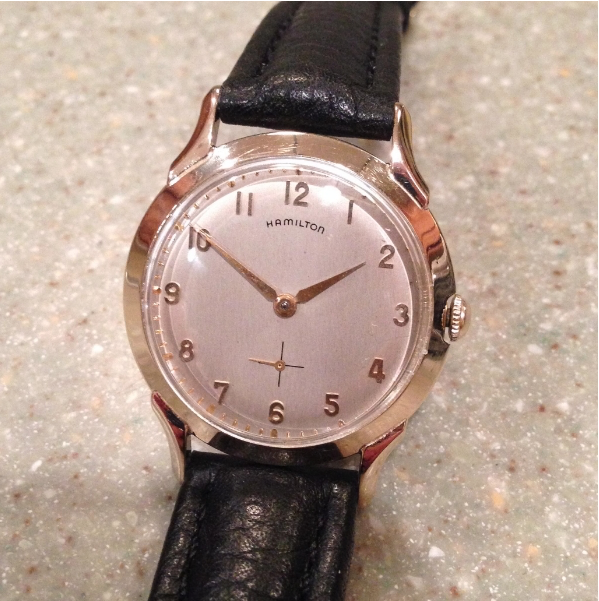 Hi, I recently acquired a Powell from 1955, however it has the 747 movement in it, is this watch from a different year then I thought it was? If you look closely at the 747 you may see that it doesn't have a serial number on the train bridge. That would indicate it is a later 747... toward the end of the run and that the Powell is an early version. I know this is an aged topic but I have a question also I have a very fine running Powell in very good condition. However the crown appears to be a replacement. It does not have that rounded off profile but instead it is straight in profile. It's proportionate to thecwatchbthankfully though. My question is did the time period of these watches all share the same crown and therefore would there be a good chance I might find an original crown to that period? Thanks for such a nice write up btw! Generally speaking each model has a specific crown and different models could use the same crown. At the same time, other crowns can also work. Crowns are surprising complex. There are specific dimensions, shape, material and application factors that are at play. For example, the Powell has a recess for the crown so it can only be so big without rubbing the case. It's also dust proof. It's also tap 10 threaded and it's yellow. Based on that, many different crowns would work. That said, the one pictured above on separate watches is probably the "correct" one. Thanks very much! That is informative and helpful. I suppose I'll look for another Powell being sold for parts on eBay as a safe approach. The crown that is on my Powell functions fine for now. It's just not correct. Unless your watch is a museum piece, does it really matter? The crown is probably similar to what is shown in the two different models above. As for what part number that crown is and how to find one? Good question but I don't have the answer for you.